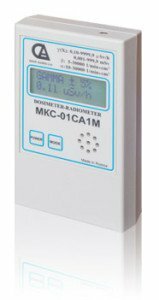 As per its specifications, the dosimeter-radiometer MKS-01SA1M fully complies with requirements stipulated in the instructions of Central bank RF №131-I dated 04.12.2007 «Manner of detection, temporary storage, cleaning and elimination of banknotes contaminated with radioactivity», came in force in RF on 03 February 2008. The instrument can be used in operation by NPP personnel and radiation monitoring services, Emergency control ministry, health, environment protection authorities, agricultural producers, builders, customs and other organizations, which are working, as a rule, under the normal conditions, but engaged in detection of local radiation sources or single objects, contaminated with radioactive nuclides. – manually once per minute .